This week, Allison Gingras is talking about "Created to Relate: God's Design for Peace and Joy" on her radio show, which airs on Real Life Radio. If you tune in daily at 9am CST, you can listen as Allison not only unpacks the book, but adds her own insightful, and very witty, comments. Allison truly has a heart for sharing the fruits that come from learning and growing in the faith in the small group setting. When she first posted that she was going to be reviewing my book, she told people a little bit about who I am and then added #SeparatedAtBirth. I had to chuckle when I saw it, and now after hearing her talk about the importance of building relationships, and how deeply she believes that we must support and encourage one another on this journey, I think she might be right! Through the gracious donation of Servant Books, one lucky raffle winner will win 8 copies of "Created to Relate," but should you win, your victory comes with one little caveat—you have to invite 7 friends, or acquaintances, or whomever the Spirit prompts you to invite, to join you for a "Created to Relate" book club. If you've never led a small group, no worries, Allison explains how easy it is on her podcast from 8-4-15. And truly, if these are 7 of your friends, no need to worry, the reflections and the questions are provided at the end of each chapter, and if you serve anything chocolate, you're sure to be a hit! To enter the raffle to win 8 books, click here. One invitation can have an eternal ripple effect. Ten years ago a friend invited me—well, to be honest, more like “volun-told” me—to join a Bible study, and ten years ago my life was drastically changed. I’ve spent the last decade deepening my relationship with Jesus, falling in love with each person of the Trinity anew and traveling the country to share the joy of the Gospel. My heart was transformed and my spirit lit on fire to share the faith, and all because of one simple invitation. It’s amazing to imagine what one invitation can do. In fact, here’s a perfect example: “On the third day, there was a marriage in Cana in Galilee and the mother of Jesus was there; Jesus was also invited to the marriage, with his disciples” (John 2:1). Think about that. Someone invited Mary to a wedding… and they also invited Jesus. Someone invited Mary and Jesus to the wedding, and look what happened! Lives were change and hearts were transformed on that day, and every day since. The story of the Wedding in Cana perfectly sums up WINE: Women In the New Evangelization. WINE is about meeting women in their need and inviting them into relationship—relationship with other women and relationship with Jesus Christ. WINE is about growing in our love for the Lord by following the example of the perfect woman, Mary, and striving to always do the will of God, striving to do whatever he tells us. WINE is about living our Catholic faith with renewed confidence, with conviction and hope, and one of the beauties of our faith is that we are a community. We’re all in this together. It’s not always easy to know and live the will of God. How blessed I am to have strong Christ-centered friends who help me as I stumble along this path. And many of these friendships are the result of one simple invitation years ago to join a Bible study. We invite you to visit our new website at www.WomenIntheNewEvangelization.com and to set it as one of your favorites. It is our hope at WINE, that you find peace, joy and a sense of belonging in the friendships that come about as a result of spending time laughing and learning and growing in your faith with other women. May we always be there to assist each other as we grow deeper in our personal relationship with Jesus. May we open our hearts to an invitation from the Lord to follow him and invite others to journey along with us. And may we always be there to guide, encourage and support one another as we each strive to do the will of God—to do whatever he tells us. This time of year can be difficult for many. For example, 2,000+ years ago a young woman was close to giving birth, traveling by foot (or perhaps donkey) over rugged terrain, not knowing where she would be during childbirth, yet knowing something astonishing was about to take place that would drastically change her life—and the world….. forever! If you're struggling right now with difficulties in your life, ask Our Lady to help you. She is our Mother of Mercy. Ask her to untie the knots that cause you anxiety or pain or distress. She'll do it! My first book, Created to Relate: God's Design for Peace and Joy, is now available for pre-order! This simple, quick, and at times humorous book focuses on the fact that women are radically relational and shows how once we recognize the beauty of being created so "radically" we can live in our gift and find peace and joy amid the greatest chaos. Time to Bombard the Heavens! When Blessed Mother Teresa needed extra graces, and needed them fast, she would pray a Flying Novena. Turns out, I could use some extra graces to get me to the Women's Morning of Spirituality in Memphis. Now, when I first heard of this notion of a Flying Novena, I was excited for two reasons. Number one, I love Blessed Mother Teresa. Two years ago she was my patron saint for the year and as I look back, it was one of the most spiritual years for me and oddly—though not to Mother Teresa—it was a year in which I spread the message of consecration to Jesus through Mary around the country. Number two, it's a perfect novena for busy person, because it is quick and simple! Blessed Mother Teresa's Flying Novena consisted of nine Memorares in a row, and then get this—she'd add a tenth one in thanksgiving for the intention she KNEW the Blessed Mother would lay before her Son and her Son would answer. So cool! On Friday, I am heading to Memphis for the Women's Morning of Spirituality, where they are expecting 1,200 women coming together to praise the Lord, rejoice in their gifts as women and grow in their faith. That means, I get to leave the frozen tundra of Minnesota for the balmy temps of Memphis, but there appears to be a little caveat—they just predicted 12 inches of snow would cover Minneapolis this afternoon. Therefore, I'm inviting you to join me in a Flying Novena. So, as the skies begin to bombard us with snowflakes, let us bombard the heavens with prayer! This is one of the most beautiful, insightful and thought provoking reflections on the three wise men I have ever read, and I count it a great blessing to share it with you. Many writings and reflections focus on the three wise men from 2,000 years ago. In this reflection, Patricia Jannuzzi focuses on the here and now —God-with-us TODAY, as she asks us to consider the three wise men God has gifted us, in our time, to lead us to His Son. Over two thousand years ago Our Savior was born. Angels sang. Shepherds watched. Oriented Wise men visited. The three wise men followed a Star in the Heavens to find Our God, Our Centre humbly lying in a manger. Christ arrived and lay where the animals ate. The wise kings knelt. They offered Him gifts. Not much is known about the three wise men, such as who gave what gift, but I like to think Caspar, the youngest, offered Gold, signifying humble Kingship. Melchior, the mindful stargazer, offered the smoke of Frankincense, signifying prayer and His Divinity. Balthazar offered Myrrh, a fragrant ointment used to anoint the dead, signifying His humanity and our humanity. The three wise men departed by a different route to protect the new born King from the jealousy and tyranny of Herod the Great. They entered Bethlehem with temporal treasure. They left with eternal treasure. They continued into the periphery. The eternal centre of Christ was stamped in their hearts, minds, bodies and souls. Approximately two thousand years later on the cusp of the Third Millennium in the small “peripheries” of Poland, Germany and Argentina, three male infants were born to be baptized as Carol Wojtyla, Joseph Ratzinger and Jorge Bergoglio. They were lovingly raised in the tender lap of Mother Church. At a young age they encountered Christ in the “Centres” of their families and Church. As they grew up, they learned to follow the Heavenly Star, Our Blessed Mother, who led them to Christ. Carol joined a “living Rosary”, Joseph frequented the Marian Shrine of Otting and Jorge devoted himself deeply to Our Lady of Knots and Our Lady of Aparcedia. Like the three wise men, Mary’s prayer, the heavenly star, guided these young men to Christ. They heard The Lord ask, “What gifts do you bring to me “Carol, Joseph, Jorge?" They answered, “Our complete lives Lord. We want to be your Priests.” He accepted their gifts with joy! They were anointed. They became His priests! Each developed their God given Gifts in extraordinary ways and under extraordinary circumstances. Carol used them in the periphery of Philosophy under the dictates of Nazism and Communism. Joseph used them in the periphery of Theology under the dictates of theological Revolutionaries. Jorge used them in the periphery of the poor under the dictates of corruption. Each had threatening adversaries such as Nazism, Communism, Corruption, Fundamentalism, Atheism, Secularism, and the worst enemy of all, betrayal from within. Each answered their adversaries with humility, love, dialogue and prayer. Do you generously offer the eternal centre of Christ? Do you recognize Christ who is sacramentally stamped within your heart, mind, body and soul for His mission? The Lord has set the stage for the New Millennium! He has given us three great wise men with extraordinary gifts to lead us. Let us embrace them! Let us follow their lead and give back to God the gifts He has given us to build His kingdom. And let us go to the periphery proclaiming Christ is the Centre of our lives in all we do! Can you imagine the headline: “Man falls from window after sermon puts him to sleep?” This actually happened to a young man named Eutychus while he listened to the preaching of no less than Saint Paul himself, as we can read in the Acts of the Apostles (Acts 20:9). We shouldn’t judge poor Eutychus too harshly, however. Scripture makes it quite clear that Saint Paul had “talked on and on”- until midnight, as a matter of fact- and Saint Paul once admitted that he wasn’t the most exciting public speaker. Saint Paul was an inspired evangelist, to be sure, and God used his words to touch the hearts of countless people. Since then, the Church has been blessed with the gifts of many outstanding preachers, such as Saint Dominic and Saint Anthony of Padua. At the same time, Saint Paul wasn’t the last preacher to put his listeners to sleep. And that’s a shame! Good preaching builds up the Church, glorifies God, and changes lives. Preaching is so important, in fact, that Pope Francis makes a special point of discussing the proper preparation of homilies in his new Apostolic Exhortation, Evangelii Gaudium. It’s been joked that, at ordination, every new priest or deacon is given a “pilot’s license,” in case they need to “wing it” in the pulpit. But winging it should be the exception, and not the rule, because more often than not, “winging it” produces homilies that fly about as well as a lead balloon. Pope Francis concedes that deacons and priests are busy people. Nevertheless, they should strive to make homily preparation a top priority for their ministry. Scripture insists that faith comes through what is heard. Therefore, preachers should ensure that what the faithful hear is the very best they have to offer, and comes from the heart. The bottom line is, Pope Francis concludes: “Preparation for preaching requires love.” Amen to that! Reverend R. Scott Hurd is a priest of the Archdiocese of Washington, and is presently serving a three year term as Vicar General of the Personal Ordinariate of the Chair of Saint Peter, established by Pope Benedict XVI on January 1, 2012. Fr. Hurd began his ordained ministry as an Episcopal priest and entered the Catholic Church in 1996. He holds degrees from Oxford University and the University of Richmond. He and his wife Stephanie live in Virginia with their three children. His first book, "Forgiveness: A Catholic Approach," received an "Excellence in Publishing" award from the Association of Catholic Publishers. His third book, "When Faith Feels Fragile: Hope for the Wary, Weak, and Wandering," was released in September 2013 by Pauline Books and Media. In paragraphs 135 – 144 of Evangelii Gaudium, the Holy Father speaks about the importance of the homily within the liturgical celebration. Right off the bat, Pope Francis describes what the homily can and should be, “an intense and happy experience of the Spirit, a consoling encounter with God’s word, a constant source of renewal and growth” (¶ 135). In my diaconate ministry, I have been three-times blessed by the Lord. First, the opportunities encountered to serve and console people in their need and suffering, to share in their joy and celebration, has been life-changing. Second, to share my talents to further and deepen adult education and faith formation has been a true joy. Third, to serve the Lord in my liturgical roles, including the joy of proclaiming the gospel and preaching, has deepened my own interior participation in Holy Mass and at other liturgies. As one who preaches a homily on a fairy regular basis, I welcome the Holy Father’s inspiring words of instruction, encouragement and correction in regards to the homily. Pope Francis reminds us of the words of Blessed John Paul II in Dies Domini , “the liturgical proclamation of the word of God, especially in the Eucharistic assembly, is not so much a time for meditation and catechesis as a dialogue between God and his people, a dialogue in which the great deeds of salvation are proclaimed and the demands of the covenant are continually restated.” He says of the homily, “it surpasses all forms of catechesis as the supreme moment in the dialogue between God and his people which lead up to sacramental communion” (¶ 137). Much of what Pope Francis writes in this section might seem to be directed solely to the clergy who preach, but that would be a mistake. For the proclamation of God’s word, he reminds us, is a dialogue. God speaks to us within the context of the liturgy and we all hear… and we take what we have received into our daily lives and return it to God through our love for one another and through our prayer. The priest and the deacon are called to “guide the assembly, and the preacher, to a life-changing communion with Christ in the Eucharist. This means that the words of the preacher must be measured, so that the Lord, more than his minister, will be the centre of attention” (¶ 138). If we are to be transformed by grace and led to a deeper communion with the Lord, both the preacher and the hearer must be engaged. I really like the image that Pope Francis paints of the homily being a moment of conversation, much like a mother with her child, “…she preaches in the same way that a mother speaks to her child, knowing that the child trusts that what she is teaching is for his or her benefit, for children know that they are loved” (¶ 139). He goes on to describe the homily as a heart-to-heart conversation that, “arises from the enjoyment of speaking and it enriches those who express their love for one another through the medium of words. This is an enrichment which does not consist in objects, but in persons who share themselves in dialogue” (¶ 142). We who preach should take to heart these words and give the time and thought and prayer necessary to meet these ideals and principles. This role the Lord has placed on us is both a high honor and a grave responsibility where we serve to bring God and the human person together. “To speak from the heart means that our hearts must not just be on fire, but also enlightened by the fullness of revelation and by the path travelled by God’s word in the heart of the Church and our faithful people throughout history” (¶ 144). Those who listen should recognize the encounter with their God that takes place, particularly in the Liturgy of the Word during Holy Mass. We should present ourselves as children who love to hear and do what their mother speaks to them. Deacon Mike Bickerstaff is the Editor-in-chief and co-founder of the The Integrated Catholic Life™ (www.integratedcathoiclife.org). A Catholic Deacon of the Roman Rite for the Archdiocese of Atlanta, Deacon Bickerstaff was ordained in February, 2006, and is assigned to St. Peter Chanel Catholic Church where he is the Director of Adult Education and Evangelization. To do that, to draw others to Christ, to share your love for the Lord, you must have a relationship with the person of Jesus Christ and you must have a relationship with the person sitting across from you. It’s the greatest of all commandments: Love the Lord your God and love your neighbor. So how do you have a relationship with the Lord? Well, that was addressed in many previous reflections and will be addressed throughout the remaindered of these posts, because it is the ultimate goal, union with God! Therefore, let’s talk about how we can have a relationship with a friend, an acquaintance or a stranger —a relationship that opens us up to sharing Jesus with them from heart to heart. To me, this is the biggest lesson I have learned since the Lord decided to really put me to work in His vineyard these past ten years. Much of my schooling in how to evangelize comes from spending tons of time 30,000 feet in the air sitting next to a “captive audience.” Ironically, I never set out to “evangelize” someone. I sincerely like to hear people’s stories, I like to know where they are in life and I love to share the joy I have in my heart for the work that I do... and I love sharing my love for the Lord! And in sharing my joy, I naturally share the source of it. For me it’s a relationship of love I found with the Lord through studying Sacred Scripture, and I share how that relationship with the Lord has changed my life. Each encounter is different. Sometimes I invite the person to pray with me, sometimes I assure them of my prayers for them, sometimes I share the beauty of the Scriptures, sometimes I give them a good resource that fits their need. Perhaps a website like: CatholicsComeHome.org; BibleStudyforCatholics.com; CatholicMom.com; IntegratedCatholicLife.org; CrossroadsInitiative.com; etc... or a book like My Life on the Rock; Rome Sweet Home; The Sound of His Voice; Catholicism Pure and Simple, Praying Scripture for a Change; Forgiveness: A Catholic Approach; Catechism of Hockey, etc... or a DVD or CD such as Extreme Mercy; From Mormon Missionary to Catholic Church; or From Love, By Love, For Love, etc... or sometimes we become FaceBook friends, and sometimes we go our separate ways. Though each encounter differs, each accomplishes the same task, a seed is planted. That is our job, to “respectfully and gently” plant the seed. (128) At another point on that person’s journey it may be the task of someone else to water that seed, someone else to fertilize, someone else to tend to the soil that surrounds it, someone else to put it in the light as it begins to bud. We don’t need to do it all! We can take comfort knowing that the Holy Spirit “enriches the entire evangelizing Church with different charisms” and that we have each been given charisms, gifts of the Holy Spirit, for the good of another, for the sake of building up the body of Christ. (130) (Romans 12: 4-8) We can also take great comfort and find great courage and creativity in our sharing of the Gospel message knowing it is the job of the Holy Spirit to covert souls. The Holy Spirit bridges the valley of our differences; “he alone can raise up diversity, plurality and multiplicity while at the same time bringing about unity” (131). Now, knowing we are a missionary people called to share the Gospel daily, and knowing that sharing our love for the Lord need not be some highfalutin formal presentation, but rather a sharing that can take place in the middle of an everyday conversation between two people, and knowing it is the job of the Holy Spirit to convert the soul, let us joyfully and enthusiastically go forth and “be constantly ready to bring the love of Jesus to others, and this can happen unexpectedly and in any place: on the street, in a city square, during work, on a journey” (127). Yep, this post was written by yours truly. Thanks for stopping by my blog and joining us as we slowly "sip" our way through "The Joy of the Gospel". On a side note, this is my favorite talk to give and I'm giving it tonight. So if you got a little moment, send a prayer to the Holy Spirit to be with us tonight! In this final section of the introduction (para. 14-18), Pope Francis identifies the three audiences/settings of the New Evangelization and the seven themes that shape his vision of our particular chapter in the ongoing story of salvation. These seven themes, and each of the three audiences/settings, will be explored in more detail as the document unfolds. Even though this section is a “nuts and bolts” summary of what Pope Francis will be proposing in Evangelii Gaudium, it isn’t lacking in material that both challenges us and invites reflection. While I am tempted to explore each of the three audiences here, they will be unwrapped as the document unfolds, so I will focus on the first one, as it gives us plenty to “sip” on for a daily meditation. 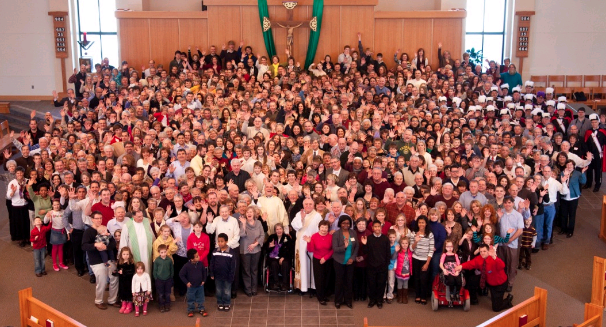 There’s a real danger of imagining that the Gospel call and the New Evangelization is about “those people out there.” And yet, for Pope Francis, the first setting of the New Evangelization is the local parish and it’s first audience is most of the people reading this series - it’s us! By us, I am presuming you are an “intentional disciple” (1) whose life is marked by “full, active and conscious” participation in the Mass (2) while flourishing in and sharing your particular charisms with the Body of Christ (3). That’s a tall order, I know, but that should be ordinary Christian living. Pope Francis reminds us we must be vigilant and continually open to the Gospel, even as seasoned disciples. The daily prayer that Pope Francis offered in para. 3 is one of my morning renewal prayers now, like Kelly, to also help me be attentive to that. When we do this, we are equipped to faithfully and fruitfully share the Gospel to the other two audiences (the baptized but not evangelized, and those who don’t yet have the gift of faith). (1) What in the world is an “intentional disciple”? See Sherry Weddell’s Forming Intentional Disciples. This should be on every Catholic bookshelf. (2) Sacrosanctum Concilium. para. 14. (3) Catechism of the Catholic Church, Nos. 798-801. THE DELIGHTFUL & COMFORTING JOY OF EVANGELIZING! Pope Francis is calling the Church to carry out The Proclamation of the Gospel in Today’s World with a renewed commitment to and appreciation for the delightful and comforting joy of evangelizing so that we and others may experience the joy that fills heaven and must fill earth when what is lost is found and what is dead is brought back to life. Is it worth the effort – and can we evangelize any other way? Yes… and no… to use the same expository style used by Pope Francis in this Apostolic Exhortation on a love that evangelizes or an evangelizing love as I am fond of saying when speaking, writing, and training others for the new evangelization. Few joys this side of heaven surpass the delightful and comforting joy of evangelizing! Few things compare to the joy of making Christ and His plan of salvation known. Few things demonstrate greater love for our neighbor and for the God who wishes everyone to be saved and to come to the knowledge of the truth (1 Tim 4: 2). No, we should not evangelize in any other way. We can. We must. Evangelize with joy! Martha Fernández-Sardina is an international, bilingual speaker, and consultant touching thousands through radio, TV, articles, training seminars, talks, and new evangelization outreach projects, including Remember You Are Loved™, N.E.T.S.-New Evangelization Training School™, Prepare The Way™, the Hispanic Festival of Faith and the Month of Hispanic Evangelization. Her programs educate, enthuse, and equip Catholics for a new evangelization. Find, friend, and follow Martha and her Mission of Love at RememberYouAreLoved.com, Facebook.com/MFernandezSardina, Twitter.com/iEvangelize, iEvangelize.wordpress.com, and Vimeo.com/MarthaFernandezSardina. For a speaking engagement or a consultation, email her at iEvangelize1@gmail.com. How ironic that as the world begins its preparation for Christmas on a day named after darkness and the void of light, Black Friday, the Holy Father invites all Christians, everywhere, to begin their preparation for Christmas with a renewed encounter with the Light of the World, Jesus Christ! We are invited to prepare for a greater joy than any Black Friday sale can provide. We are invited to a joy ever new, and that joy is found in a personal encounter with Jesus Christ. And that invitation is for ALL. No one is excluded from the joy brought by the Lord! Pope Francis gives us beautiful ways to do that in these first 8 paragraphs of Evangelii Gaudium. Simply put we are to: Ask, Seek, Rejoice and Persevere in Faith. We are to ask and be open at all times to an encounter with the one who loves us perfectly. We are to seek Him knowing that “whenever we take a step towards Jesus, we come to realize that he is already there, waiting for us with open arms.” We are to rejoice in His Divine Mercy, “radiant with the glory of Christ’s cross” and we are to persevere in our faith, trusting in God’s love, surrendering completely to the love of the Father such that we allow Him "to attain the fullest truth of our being" and we find true joy. Begin each day this Advent with the simple prayer: “Lord, I have let myself be deceived; in a thousand ways I have shunned your love, yet here I am once more, to renew my covenant with you. I need you. Save me once again, Lord, take me once more into your redeeming embrace”. I have a copy of the prayer on the cupboard that holds my coffee cup, it guarantees each day begins with asking for a renewed personal encounter with Jesus. Perhaps write the prayer on a card and keep it next to your bed to say morning and night, or tape it to your bathroom mirror. Seek time with to be with Jesus. A renewed relationship requires spending time together. Make time to go to Adoration each week during Advent. If an adoration hour is already part of your routine, take one of the Scriptures referenced in the daily readings of Evangelii Gaudium and meditate on it. Begin Advent with the Sacrament of Confession. “God never tires of forgiving us; we are the ones who tire of seeking his mercy” (Evangelii Gaudium 3). Find ways throughout the Advent Season to enter into the “great stream of joy.” Perhaps keep your favorite praise & worship CD in your car and when days get trying, blast the music and sing for joy at the top of your lungs. Grow in your faith by simplifying your life and detaching from “things” that consume you. Let go of meaningless time spent on social media or watching t.v. this Advent and spend that time getting to know Jesus Christ. Making time each day to read and reflect on Evangelii Gaudium is a great start. WHAT IS AN APOSTOLIC EXHORTATION ANYWAY? Tomorrow we begin our daily reading of Pope Francis' first apostolic exhortation, Evangelii Gaudium. Now, while apostolic exhortations have been around for hundreds of years and although Pope Francis seems to speak... well... frankly, words such as "apostolic exhortation" aren't very mainstream words. In fact, most of us are left scratching our heads saying, "Apostolic Exhort-what-tion?" So, let's begin our journey through this document knowing what it is and why is is important to every Christian. Catholic speaker and presenter, Thomas Smith, explains what an apostolic exhortation is and how it is pertinent for our lives today as he helps us prepare our hearts this Advent in this wonderful to-the-point 4 minute video. "THE JOY OF THE GOSPEL fills the hearts and lives of all who encounter Jesus. Those who accept his offer of salvation are set free from sin, sorrow, inner emptiness and loneliness. With Christ joy is constantly born anew. In this Exhortation I wish to encourage the Christian faithful to embark upon a new chapter of evangelization marked by this joy, while pointing out new paths for the Church’s journey in years to come" (Evangelii Gaudium, 1). I am excited to have you join us —yes, us; for I have a few friends joining me in the journey through the "Joy of the Gospel" this Advent and I am thrilled that they will be contributing to our daily reading, reflection and response to the words of Pope Francis' first apostolic exhortation, Evangelii Gaudium. Some of the contributors to our daily reflections are Catholic writers or speakers, some are catechist or leaders of apostolates, some are moms or homemakers, some are religious, some are laity, some are podcasters, some authors and some are bloggers, but ALL of them are passionate about bringing the JOY of the Gospel to the hearts of many. So let's cut to the chase and get to the why and what we are doing. My life is busy and I'll be honest, sometimes that means my prayer life and quest for knowledge get pushed to the backseat with many a forgotten french fry and art project; but that said, I really yearn to know and understand my faith, because I know that understanding and wisdom will lead me deeper into my relationship with the Lord, and I need a deeper relationship with the Lord! With that in mind, I decided (as I do every year) that this Advent, I really want to prepare my heart for Christ to enter ever deeper. This Advent is going to be different. This Advent I am going to stick to my plan... but this Advent there seems to be more to it than just my own personal preparation. Upon reflecting on Advent and the coming of the Lord, it hit me that Advent is not just about preparing my heart to be a dwelling place for Christ, it's also about going in haste to bring Jesus to others, like Mary did when she was told she was to be the one that would prepare Jesus to enter the world as a baby and become man. Advent isn't just about my relationship with Jesus, it's about relationships in the grand sense of the word. It's about my relationship with others and my willingness to introduce them to a relationship with Jesus. It is what Mary did when she heard the first good news proclaimed by the angel. She went in haste to meet Elizabeth where Elizabeth was on her journey and she literally brought Jesus to Elizabeth. And what was the result? Upon hearing Mary's voice and knowing Jesus, "My Lord", was near, John leapt in the womb of his mother. Now get this! What does Mary do? She is so overcome with joy that she breaks out into song, and her heart magnifies the Lord! This Advent I want to do that. I want to walk in Mary's footsteps and prepare my heart to receive Christ. I want to meditate on the Word of God. I want to go in haste to bring Jesus to others, and I want to be overcome with the Joy of the Gospel! I want to “Shout aloud and sing for joy!” (Though I guarantee you do not want me to break out in song!) But, here's the catch... every Advent I start out with the goal of setting time aside each day to prepare for Jesus and somehow, at sometime along the journey, I get distracted. So, how am I going to stay focused this year? Simple, I'm doing two little things. First, I'm going to set time aside for prayer each day. I've already posted the prayer from Evangelii Gaudium (see below) on the cupboard that holds my coffee cup, so it's a gimme that I will begin each day with that prayer. Second, I'm going to grow in my understanding of the faith this Advent by reading and reflecting on the words of the Holy Father in his first apostolic exhortation, the Joy of the Gospel. Ok, I admit, reading an apostolic exhortation sounds intimidating to many. Reading 224 pages of Church talk sounds intimidating to many. Reading 288 paragraphs of papal writing sounds intimidating to many, and reading 48,000 words sounds intimidating to all! BUT, when presented in small doses with some food for thought and a little strong coffee, the apostolic exhortation mountain top appears more accessible. So, that's what we are going to do here for the next 25 days. We are going to take little bites of Evangelii Gaudium and I invite you to join us! Each day will have a reflection, challenge or perhaps practical ideas for how to live the aspect of the Gospel that day's words speak to. We will for sure post the 288 paragraphs such that by Christmas we (and hopefully other busy people) will have read and meditated on some 48,000 words, but in small sips. Prepare your heart this Advent over a cup of coffee and little "sips" of the "Joy of the Gospel" with us! Each day we are going to read & reflect on sections of Pope Francis' first apostolic exhortation, Evangelii Gaudium. Fear not, if you don't know what an apostolic exhortation is, fellow co-worker in the vineyard, Jimmy Akin has a great explanation over on his blog www.JimmyAkin.com. 2) What is an apostolic exhortation? It’s a papal document that, as the name suggests, exhorts people to implement a particular aspect of the Church’s life and teaching. Its purpose is not to teach new doctrine, but to suggest how Church teachings and practices can be profitably applied today. Some apostolic exhortations are devoted to the pastoral challenges faced in particular parts of the world (Europe, Africa, Asia, the Americas). Others are devoted to particular themes. FINDING JOY IN THE GOSPEL THIS ADVENT! The document turned out to be richer than my Nestle's Coffee Mate drenched coffee and I soon came to the conclusion that I could not digest it all in this one sitting. So, I thought... small sips... and I came up with the idea to read a section of Evangelii Gaudium each morning over my coffee during Advent. Then I thought, there's no way I can do this alone! I won't grasp the fullness of the message, and let's be honest, I'd probably quit by day 8 without someone to prod me on (that's what happens with my workout schedule anyway.) Thus, I'd like to invite you to join me. Throughout Advent I am going to post sections of Evangelii Gaudium and hopefully a reflection or some practical things I'm going to try to do to live the message of that section with renewed conviction, with confidence and with hope. Again, I invite you to join me. Pour yourself a cup of coffee (or Diet Coke or whatever wakes you up) and join me in reading this rich Apostolic Exhortation in small sips. Join me by sharing your reflections and by offering ways we can live the Joy in the Gospel. We begin this Sunday! You in? I love the Holy Spirit! That seems like a pretty normal thing for a Christian to say, but truth be told, it wasn't long ago when I would have said, "Holy Spirit, Who?" Then slowly and patiently the Holy Spirit weaved His way into the muddled tapestry of my life. Soon I was talking to Him. Gasp! (As the kids say, "I know, right?") I was forging a relationship with the Spirit—I didn't even know Catholics did that kind of thing! Turns out, the Catholic Church is the oldest Pentecostal Church, the very roots of the Church are Pentecost. Pentecost was an astonishing encounter with the power of the Holy Spirit that gave birth to the Church, empowering the apostles to go forward with boldness and confidence and bring others to that experience with the living Christ. How cool is that? And how cool is it that it is still happening today.... unceasingly! People experience the Risen Christ in the power of the Holy Spirit and as such they enter into a deep personal relationship with Jesus. That's so cool! That's what happened to me, but as on the day of Pentecost there was no "mighty wind", nor did I speak in tongues. It was just the constant soft gentle sound of His voice tenderly guiding me home, and as I began to listen and be open to the Spirit, joy began to take hold of my heart and a clarity of the gifts He had given me to build up the kingdom began to emerge. Soon the muddled tapestry began to take on form in the design God has planned for my life. God has given me a transforming power in the power of the Holy Spirit, and He has given it to you too. Now it's up to us to call on the Spirit, to surrender to Him, to pray for the gifts, to rejoice in the fruits, and to allow the Spirit to lead us to a personal experience of Jesus' actions in our lives such that we respond to His will for us. So today, I'm sitting down with "The Sound of His Voice" and I'm going to do my best to calm and quiet my soul and listen to the tender call of the voice of my Rabbi, and something tells me -in the depths of my heart- that with each moment spent with the Spirit another thread will find it's proper place in the tapestry of my life—a beautiful design that was planned for me since the moment I was conceived in the heart of the Father. If you're in the Twin Cities, I'd love to have you join us at St. John the Baptist in Savage for a little luncheon sure to be packed with fun, food, faith and a few laughs! See the flyer below, and feel free to invite your girlfriends!